The invitation to attend the seminar on South Asian Minorities in Islamabad, Pakistan and other meetings in Karachi, promised to be an exciting affair, as apart from other things it might have been an opportunity to see the ‘enemy country’ in person. I thought of combining the visit to Islamabad and Karachi with a trip to Jhang, the place where I was born, slightly before the tragedy of partition. I realized VISA to Pakistan is quite a difficult task as VISA for each city is to be obtained separately so I dropped the idea of going to Jhang and restricting my visit to Islamabad and Karachi for which I had the invitations. The discussion about the proposed trip to Pakistan with friends and relatives had a standard response, ohh… you are going to Pakistaaaaaan… be careful! The impression being given was not only that it is Pakistan, which is masterminding all the terror operations in India, not only that it’s a country with terrorists strolling the street and killing people at will but also that it is an ‘enemy country’ due to its wars against India, its meddling in the issues of India and it harboring the terror dens by the dozen. Islamabad sounded like an exclusive ‘Capital city’ with non Government employees being a small fraction of the population in the city. We could see the Raval Lake, from the nearby beautiful hill. The lake separates this capital city from the nearby Ravalpindi. What came as a pleasant surprise was the feeling of being at home in the city, the language spoken, the people, the warmth and affection and the food all gave the pleasant feeling of being very much at home. While one learnt that the plight of minorities is dismal in most of the South Asian countries on which the papers were presented in the seminar, one also realized that the human rights activists in Pakistan are very vocal and are keeping the torch of democratic values aflame with great courage and sincerity. The banquet hosted by organizers was an occasion to interact with the well known names in Human Rights movements from Pakistan, like I.A. Rahman. Could lay my hands on Rahman’s booklet, ‘Pakistan: Neither A State nor a Nation’ which gives a very accurate understanding of the state which came into being more due to the machinations of colonial powers than for the aspirations of average Muslims. Incidentally majority of Muslims and particularly the poorer lot, the artisans, farmers stood against the idea of Pakistan. The banquet dinner was a surprise for another reason also. In the middle of the lovely food and equally engrossing conversation, I had been so lost in the homeliness of milieu and the accompanying songs from my favorite old Hindi films that I had to tell myself oh I am not in India but am in Pakistan. The singing troupe playing the music was very good and the choice of songs from old Hindi films was a real treat of the day. Staying in Karachi was a different ball game. Here one was in the middle of different communities staying in different localities. The segregation of communities along geographical lines is a bit different than what is the phenomenon of ghettotization of Muslim community in many a cities in India. Karachi with its broad roads and slow traffic reminded me of our own Mumbai nearly five decades ago. Conversation with taxi derivers’ is so much revealing about the things in a city. My driver was a young man from Peshawar. He had to come to Karachi due to the Taliban nuisance. Taliban, in a true fundamentalist fashion, are imposing dress-beard code on the people and are killing people for any slight disobedience. This young man told me that they used to organize Music and dance, week long celebrations at the wedding times. Now Taliban has put a sort of ban on that. The Taliban intimidation is forcing large segments of population to shift from Peshawar to Karachi in particular. He also informed about what many Indian writers are calling as soft power of India, the Bollywood. For this young man, three Khans of our Bollywood are semi gods, like he celebrated when Shah Rukh Khan’s team won in IPL and he sported Mangal Pandey moustache and kept the hairs like Mangal Pandey as depicted in the film. It’s no secret that Hindi films and Indian music are a craze there. I happened to meet innumerable friends who are struggling it out not only to strengthen democracy but also to build bridges with India. 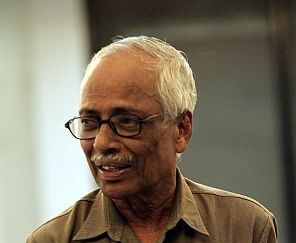 One remarkable Comrade from our Kerala, B.M. Kutty is a very popular figure in Karachi. Kutty Sahib, as he is generally addressed there is part of most of the progressive campaigns and movements, shaping and guiding the younger lot into the values needed for a democratic society and secular sate. This Malyalee doyen is there from last six decades and his autobiography is aptly titled, ‘Six Decades of exile: No regrets’. Other friends and comrades from media, trade unions and Karachi University were not only warm but also expressed how much they long for the state of affairs where military can be packed off to the barracks and civilian society is able to have its say through the democratic government. The very concept of Islamic state also meets its nemesis in the form of Mohajir Qaumi Movement, supported by many Muslims who left for Pakistan from India. They could not get due rights in Pakistan and are now organized enough to get represented in Pakistan Senate and corporations. The legendary Karachi press club has been able to maintain its independence, despite the pressure of military and it keeps inviting the diverse speakers to speak about their views on matters controversial, on the lines which may be against the ideas of ruling cliques. One of the favorite themes of talks there was, ‘Shared heritage: Common aspirations’, where the commonality of our cultural past was highlighted and a need for broad cooperation between these two so called ‘enemy nations’ is articulated in a very positive manner.